It is a truth universally acknowledged -by picture book editors- that a picture book manuscript landing on an editor's desk is highly likely to be in want of a serious word-slashing. He was brilliant. We’d put up a 600-word manuscript to be critiqued and with a swish and a slash (or a rattle of keyboard keys), it would come back at 400 words, just like that. And it was almost always the better for it (even if, temporarily, we weren't). Of course not everyone is lucky enough to have an external word-slasher, so it is extremely useful to hone your own word-slashing skills. Reducing the word count of your picture book manuscript for its own sake would be a very crude way of editing. But most picture book manuscripts are too long (ask any picture book editor). So, in conjunction with a really good understanding of the picture book form, losing (the RIGHT, or should that be WRONG?) words can help shape your manuscript into something really special. It’s often easier to slash someone else’s words, so I’ve put a chunk of my not-quite-final version of Don’t Panic, Annika! at the end of this post in case anyone wants to practise on mine, first. You can let rip on it and see how your edits compare with the final picture book. Editing picture book manuscripts is different from editing other manuscripts. Being manuscripts, they do not have pictures in, and yet the form of the picture book means that the story is told through both the pictures and the text. This can make it trickier to edit, and, until you’re confident of what a great picture book manuscript (as opposed to the book itself) looks like, possibly less satisfying, too. A manuscript for a great novel will read as brilliantly as the novel itself. A manuscript for a great picture book will not. But that’s the point. It’s not MEANT to. It’s a picture book. It’s all about the book as a whole. The Baby That Roared by Simon Puttock and Nadia Shireen (Nosy Crow, 2012) is an excellent example of a recent picture book written by an author as opposed to an illustrator-author where the pictures and text combine beautifully. Then look at that manuscript alongside the book and ask yourself: what would you have to put as an illustration note in order for an editor to understand the story? Add those necessary notes to the manuscript. How does the manuscript look without the pictures? When a picture book is really good, since you read it as a whole (pictures and text together) you often don’t realise at first how much of it is told through the pictures. 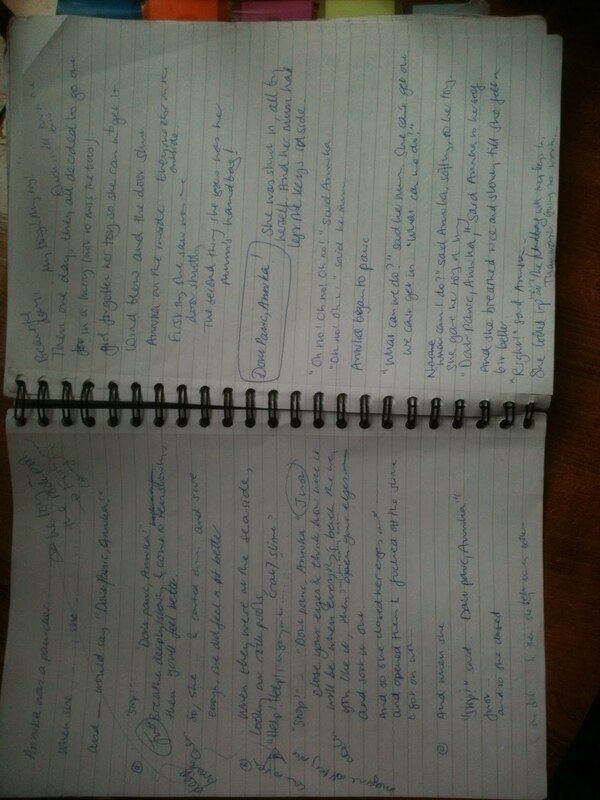 It can be very enlightening to see what can look like a disjointed manuscript for a great picture book. Remember, you’re not aiming for something that will flow beautifully without the aid of pictures (as it will look as a manuscript in your hands); you are looking for something that will flow beautifully as a picture book. This may mean, compared to a novel -told entirely through the text, your manuscript will look less impressive to your friends or even writers who usually only see picture books in their finished forms. Indeed, a more polished version of your picture book manuscript, where you are letting the pictures take on the job that some of your text was doing previously, will often appear less appealing to someone not used to a picture book manuscript than an earlier version where the -imagined- pictures aren't pulling their weight. However, picture book editors know how to imagine the pictures. It's their job. Now look at your own manuscript. How does it compare, visually? Could your text be less dense? Could you let your pictures (even if they’re currently only in your head) do more of the work? Could you use interesting page turns (which, incidentally, can often tighten up your manuscript by letting the pictures work harder)? Capture your story in a single sentence and write it down. Keep referring back to this sentence when you read through your story. Is every line/word adding something important to your story (as summarised in your sentence)? If not, could you cut it? And is there anything else that could be shown through the pictures and not the text? If it helps to do this with an old manuscript of yours first before moving onto your current one, that’s fine. Write your word count on top of your story. Go through your manuscript (it often helps to do this on a hard copy) and be ruthless, cutting out everything that’s not necessary –even if it’s your favourite phrase/word. If you’re cutting out text so that the pictures can take on more of the story, then jot down as many illustrator notes as you want to –at this stage. See how many words you can remove without losing sight of the story. This doesn’t have to be your final copy, so don’t worry about over-slashing. Try and leave at least a day before going back to this new (exercise) version –and preferably longer. Re-read it. Does it still make sense? You may be pleasantly surprised. Could you get used to it in this shorter form? I usually find that I prefer the shorter version, even when some of my previously favourite phrases have gone. Could you use your slashed version (even if you choose to add in a few extra words)? And can you now remove any of the illustration notes? Even if you don’t choose to use your exercise version, when you re-read your original version, it may well seem overly long and it may be easier to tighten it up a little less drastically. Create the picture book experience (or as close as you can without the pictures). Print your manuscript and cut out the text and stick it on to an existing picture book in the place where you think it works (I use blue tack). Then video yourself reading it at the right pace and with the right page turns. Although it can be embarrassing to watch initially (it was with Don’t Panic, Annika! ), you needn’t show anyone else (I won’t), and it can be extremely useful for creating the experience of a picture book reading so you can do a final edit before sending it off. Show your manuscript to other writers, and preferably picture book writers. Those who aren’t used to picture book manuscripts will probably think you need to tell more in the text of the story (so it’s easier to read as a manuscript) and have fewer illustration notes. Those who are used to picture book manuscripts will often think you can leave more to the illustrations –and often without having to add in extra illustration notes. Remember, it is the job of the editor to imagine the story visually. I don’t think it’s any coincidence that some of the very best and truest picture books are written by illustrator-authors –two of my all-time favourites are Not Now, Bernard by David McKee and Rosie’s Walk by Pat Hutchins (which, incidentally, started out as a normal-length text. Her editor read it and showed her a single line that he really liked -about the fox following her. That then became the whole story whilst never actually being mentioned in the text). I was going to put a picture of Not Now Bernard and Rosie's Walk up but I look at those books so frequently that I've mislaid them. So here's a random cute-picture-of-a-child-in-a-wig, instead. But I don’t love these books most for their illustrations. In fact, there are many books whose illustrations I prefer. I love them for their storytelling, which is so perfect a combination of words and pictures. Authors-who-don’t-illustrate can, of course, achieve this (see Pippa Goodheart's post on Arthur's Tractor), but I think it’s something that comes less naturally to some of us than to illustrator-authors. What we need is practise, practise, practise… and to know a good-looking picture book manuscript when we see one. Scene from Spreads 1 and 2. ORIGINAL VERSION AND COMMENTS ON THE FINAL EDIT. When things went wrong, she always panicked. She panicked at the seaside when she dropped Moose in the rock pool. “He’s fallen in! I can’t get him! He’s going to sink! I’ll never see him again!” she shouted. “Try fishing him out with your net,” said her dad. “I can’t! I can’t!” shouted Annika. So Annika breathed in and out, in and out, really slowly, and sure enough, she did feel a bit better. And she fished Moose out of the rock pool. And she panicked when she couldn’t find Moose at bedtime. “Try thinking where you might have left him,” said her mother. So Annika closed her eyes and thought about how nice it would be falling asleep all snuggled up with Moose, and sure enough, she did feel a bit better. And then she remembered. counted up to ten, nice and slowly. And she felt a bit better. And then she remembered. There were spare keys hanging up in the kitchen! But the spare keys were too high as well. closed her eyes and thought about how nice it would be, flying kites, all together again. And she felt a bit better. She got her fishing net and stretched it up to the keys and hooked them into the net. EXAMPLE 4: THE SCENE FROM Spread 10. HERE, THE WORD COUNT IS HALVED, FROM 74 TO 38. Outside, a crowd was gathering. “What shall we do?” shouted the milkman. “We can’t get in! The windows are all shut,” shouted Annika’s mother. “We’ll have to phone for help!” shouted the neighbour. “STOP!” called a voice from inside the house. It was Annika. 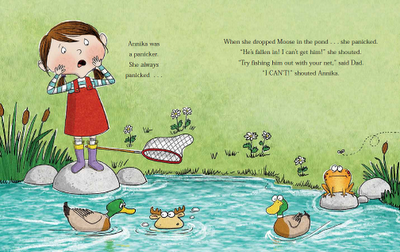 “Don’t panic, Annika!” shouted everyone. “I’m not panicking,” said Annika, calmly. “But you’re inside and we’re outside, and you can’t get out and we can’t get in!” shouted her mum. Back in the hall, Annika heard a terrible racket coming from outside. “I’m not panicking,” said Annika. “BUT YOU CAN’T GET OUT AND WE CAN’T GET IN!” shouted her mum. 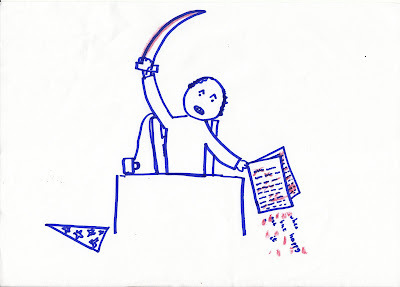 Happy slashing… (and please do leave your own top tips for editing your picture book manuscripts in the comments, below). Thank you. Really interesting to see your editing process - thanks, Claire! Thank you, Lesley. You asked on facebook whether the editing was done with the editor or before sending it to the editor. The edits for this were done BEFORE sending it to the editor. My editor at Piccadilly changed about five words before getting the roughs done. However, it was sent out to a number of publishers and before we'd heard back from Piccadilly, I'd done a big rewrite (tackling the story slightly differently)for a different publisher, and although they didn't take it on in the end, I liked some of the new changes. So although Piccadilly took it on with almost no changes, I actually asked if I could incorporate some of my new changes into their version -which they were happy to do. So your book was 'market-ready' when it went out. Did your agent give feedback at any stage that affected the edits? Just curious! Sorry, Lesley, I missed this. When I first met my agent, she (and he -they're a double act now) did make some suggestions before it went back out again but she'd already shown it to an editor who was interested. So the revised version was seen by some but not all. Hope that makes sense! Some of my manuscripts go straight out when I send them to my agent; others come back with a few suggestions. Some, they just don't get! I really enjoyed reading this - thanks Clare. It's useful to see another PB writer's process of editing, especially for non-rhyming stories. I'm trying some of those at the moment and finding them much harder than rhyme! This will be invaluable. Thank you, Joolze (Julie Fulton?). I think that when you lose the rhyme, you suddenly have to let the pictures take on more of the story. Rhyming picture books do 'get away with' using the pictures in a more 'illustrated story' way (as opposed to picture book) -because the rhyming is so central to the book. And a rhyming story is more likely to be read in one go (like a poem), without stopping to 'read' the story in the pictures. When I read 'Don't Panic, Annika!' with children in schools, it always takes loads longer to read than when I read 'The Kite Princess' which is a rhyming story. Stopping regularly to talk about the story -and the pictures- breaks the flow with a rhyming book in a way that it doesn't so much with a non-rhyming one. If too much of a rhyming story were in the pictures, then it would affect the picture book reading experience as you wouldn't get the full benefit of the rhythm of the story. Would you agree? Superb post, as always, Clare. Out of interest, what was the final total word count on Annika? I aim for 400 max, but occasionally allow it to stretch towards the 500 mark. Thanks, Malachy. Annika is actually a high word count book for me: it's got 524 words. Most of mine now would be around 400 -and some, way below. I was always surprised when I first started typing out others' manuscripts to find that Julia Donaldson books were around 450. I'd thought they were longer. I think it's good to be aiming low! Yes, I was thinking it was still high end. counted to ten, nice and slowly. And then she remembered. There were spare keys in the kitchen. But they were too high! She closed her eyes and thought about kite-flying. When she felt a bit better, she stretched up and hooked the keys into her fishing net! Thank you, Clare! I'm working on a picture book this week, after a while away from the genre, and this has reminded me what I should and shouldn't be doing. Really helpful. Thanks, Moira, and really good luck with the picture book. It's probably even harder when you're writing for much older children, too, to come back to a form where every word has to be justified. Yes - a great post! Love what you say about creating the experience. It's the same problem really for illustrators and illustrator-authors, respecting the bones of the story. We're casting directors and make up artists, and set designers, but need to chuck out furniture - and sometimes even characters - that might overload the experience. The art is in retaining just enough keep just enough to draw readers back in for further experiences. Thank you -I'm so glad we've got a view from the illustrator-author side. I feel like writing picture books is slightly similar to writing for the screen whereas writing novels is more like writing for radio. I love the way you describe it, Bridget. What an insightful blog. Thanks so much for sharing. For years I've wished I could go back in time and cut the texts in some of my books - I even leave out some bits when I read them to children. However, at the time I thought every word was needed! Mind you, I was once told by a doyen of picture book publishing that a story is as long as it needs to be (after too many cuts had been made on the premise that fewer words is always better). I agree, but knowing what's necessary, and what isn't, is tricky. Thanks, Paeony. I have a similar feeling when I look back over old manuscripts that I've not reread for a long time -but I can see it's more frustrating when they're actually in print! I expect I'll feel that about some in the future (and there is a rogue word in one of my books that I NEVER read -but how it got there is a long story for another day...). It's easy to see how they can be made tighter after a proper break away from them where you're not so emotionally involved in them -and you can read them almost as if they're someone else's. I might even try that -putting someone else's name as the author on one of my manuscripts and seeing if it helps with being more ruthless! I know that some books do need to be longer and that's fair enough: as long as there aren't wasted words. If they're really well edited and still long, that's fine (but it's certainly a harder sell in the current picture book market!). Great post! So interesting to see how you cut down. I do it by drawing out 15 spreads in thumbnails and working out what is essential or what can be binned (I find this helps with the pacing of the book too). I like your tips and I will try them on a story I need to to get down to 800 (from 1200) today. Ooh, like the idea of 'piction' - do you know which publishers might be doing this? Thanks, Abie. I've not read those longer ones but I suspect they're what I'd think of as 'illustrated stories' rather than 'picture books'. I'd see illustrated stories as those that make complete sense with the text alone, but the pictures add texture to the story. And I'd think of picture books as those where you wouldn't be able to follow the story properly WITHOUT the pictures, often because aspects of the story (as opposed to incidental -but interesting details) are found in the pictures. The current trend is certainly for young-end picture books, especially in the UK and US, but it's great when older books are being fully illustrated, too. And I love that there are publishers publishing thousand-word highly-illustrated stories. I think it's a huge shame that slightly older children aren't still 'allowed' to love books with loads of pictures just because they've learned to read. My eight year old, who's a great reader, still reads way more picture books than novels at home because she loves them. And now she's reading some graphic novels, too. I'm all for longer stories with pictures -I just think we're calling them different things (and piction! I love that people make up new names for old things all the time...). I'll try and get hold of Tim All Alone... thanks. 'Little Black, a Pony' was one of my favorites too! Thank you, Colleen. I'm glad it's useful. Really good luck with the text! This is fantastic. Thank you so much for taking the time to share. I am going to dog ear this post for along time! Thank you, Kimberley. I'm so pleased it's useful. I've learned loads off other people in the past and continue to do so all the time. What a fantastic post, and incredibly helpful. My background is in writing children's poetry and I'm only just coming to picture books. Shamefully it wasn't so long ago that I thought that if I could write a poem then I could write a picture book - I've come to realise how very wrong I was. I've got a picture book in verse due to be published next year, but meanwhile I'm trying to turn my hand to prose as well and finding it much trickier. But after reading your post I'm relishing letting my knife loose on the manuscript. Thank you, Elli. What's the picture book due out next year, and who's it with? My next picture book is in rhyme and it's a very different process writing a rhyming book. I love both -to read and to write. Good luck with the new book for next year and with writing in prose. Different but still fun -honest! Great advice, Clare! Reading #1, made me think about one of my "finished" manuscripts and suddenly it was clear where I could let the pictures do the talking and I made a wonderful cut!! Thanks so much! 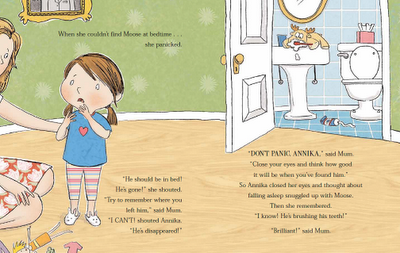 Don't Panic Annika looks adorable - I can't wait to read it!! Really pleased it sparked off an idea for you, Lori. We're big fans of 1 Zany Zoo in this family and we're going to do really exciting things with it at school this coming year. In fact, I'm giving out copies of it next Wednesday when I do an assembly to encourage children to read over the summer holiday! Can't wait to see your next book and I'm glad you're able to let the pictures do the talking. I can't wait to hear how it goes next week! We'll have to talk soon about our skype visit!! Really interesting - but it doesn't half sound hard! but fun, Sue! I feel incredibly lucky to be doing this. Don't Panic Annika is one of my daughter's favourite books and it was really interesting to see the changes that you made before it was published. It would be great to see original, unedited versions of other successful picture books. Thank you, Catherine! And I'm so pleased your daughter likes Don't Panic, Annika! It's a little tricky knowing what's ok to post and what's not -whether it's ok to put an entire early edit of a published book or not, and also, how many spreads of the final version I can post (I left the last two out). But I agree. I LOVE seeing early edits of stories that I know. It was such a huge treat to see Pat Hutchins on the amazing Picture Book programmes they did on Channel 4 a couple of years ago, where she showed her early version of Rosie's Walk -which was vastly different from the final version. It really made me think a lot about editing and the form of picture books and how as writers we don't exploit the pictures enough. I agree good editing almost invariably makes things better, and not only in a picture book. But possibly more so when each and every word has to justify its place on the page. It is often best to come back to it again and again until it is as good as it can be. I like to read out loud when I think a picture book is finished and ready to be edited. I read it as if I was reading it to a child, and this helps to focus on what works, and what doesn't and which words can be cut. Slightly older children who still love picture books with minimal text also enjoy slightly longer stories (e.g.up to 1000 words) because they are taking more from both the text and the illustrations than the youngest children. I don't think of these as any less of a picture book as the illustrations are still an integral part of the storytelling. Interesting to hear about 'piction' which sounds like much longer texts. It's a great idea and might help to combat the feeling that children become 'too old' for illustrated books. Thanks, Linda. I love picture books and illustrated books for older children and wish there were more of a market for them. I can't quite write 'piction' yet without feeling a little silly as it's an entirely new word for me, but I love what it actually is. I think children should be encouraged to continue reading books with loads of pictures as long as possible. Reading pictures is great fun and a brilliant thing to do, too. Young children are often better at spotting things in pictures than older children because they see so many picture books and are really skilled at it. Thanks, Mona -and for being a great critique partner! Do it quick. I often edit a PB text before I've read the whole thing - if a sentence feels wrong on first reading it'll still feel wrong later. Remember they are only words - they don't have feelings so you don't need to be precious about them! Keep words that move the story along and cull everything else including those told in the pictures. Rewrite anything that can be told more efficiently. For example, "Tommy was known for walking everywhere backwards," can be, "Tommy walks everywhere backwards," with no loss of meaning. Read it aloud - words you trip over are normally where its failing. Other than that trust your instincts. So pleased you recognised yourself as the demon slasher (several other people got back to me and said they'd recognised you immediately -though I expect from the description rather than the pictures). Thanks for your tips on editing. I really like what you're saying -I sometimes wonder whether I'm 'cheating' when I start critting someone's words when I've not read the whole thing through yet but I think you're right. When you're trying to tighten up the text I reckon that's a great way to do it. In terms of story and pacing, you need to be reading it through first... And I love your not being precious about words as they don't have feelings. I will remember that next time I'm word-slashing! And you're so right about reading it aloud. As for shortening the blog post, it's the old Mark Twain-ism isn't it: sorry my letter is so long. If I'd had more time it would have been shorter. My husband read my last post when it went up and said I should practise what I preach -and he's right. 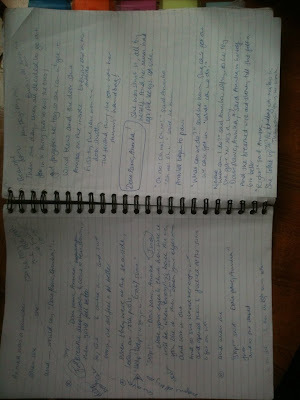 My blog posts are blatantly too wordy! I wish I could hire you to edit my life -it would be much more efficient! Words don't have feelings . . . but people do! Not everyone likes a grade 1 on their text but fortunately you never minded! Bingo. The blog and comments like yours both made my day (actually yesterday night :-D ). My story is almost 80 words short by now and still counting hopefully without losing it's essence. But I still think , to achieve feeling-less word slashing , it has to be someone else. Thank you so much for this educational post. I love it! 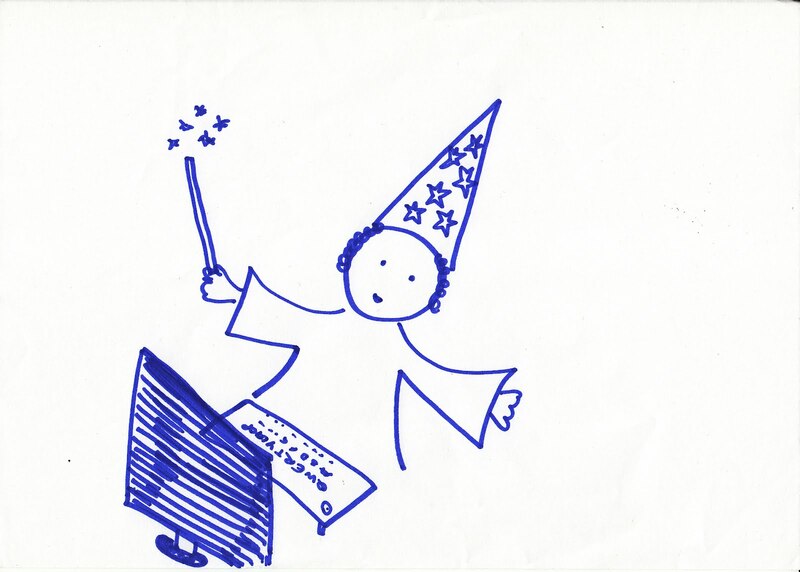 Did you have any art notes when you submitted this MS? Often times when I write out the text of a pb, I have a hard time figuring out if an art note was used or whether the author 'left space' for the illustrator to fill-out that piece of the story. I think I am fairly good at keeping text to a minimum but sometimes I get comments from my peers that I need to have a transition. Guess I'll figure it out as a I go along. Thanks, Darshana. I did have some illustration notes, but I'd just got an agent and she encouraged me to lose a few. It's easy to think they're necessary when it's only in your head, but if someone else reads it and can work it out in their head without your illustration notes, then they're not necessary. I used to write with LOTS of illustration notes but I'm better at keeping them to a minimum now -although my critique group still picks up stray ones that they can work out for themselves. (I still do have some, though, as I love writing stories where some of the story is told through the pictures). Interestingly, with The Kite Princess, which is out in September, they were happy to have the illustration notes whilst it was going back and forth between the editor and me (and unlike Don't Panic, Annika!, this one changed massively between the draft Barefoot first said they were interested in and the final printed version), but when it was properly finished, they asked for the illustration notes to be removed before they showed it to the illustrator they'd chosen. Thanks Juliet! I like to write stories, where one of the layers is being told through pictures.Thanks again for this really useful post. This is so wonderfully written: concise, concrete, and helpful! It's so nice to see specific examples rather than a set of lessons/suggestions. Thank you for sharing! We all love Annika! Thank you, Carter. And I'm very pleased you like Annika! I'd have been up for putting a whole manuscript up but I didn't have time to check with my publisher. It might just not be allowed! This is super! As an author/illustrator I find it hard to know if my few words are enough! And you are sooo right about other writers finding it difficult to critique my sparse texts. So I am finding this 'game' a great learning opportunity to see things from the other side. I really appreciate this! Thanks, Julie. It might help to do the whole cutting and pasting and blue-tacking your sparse text where you think it would work on a normal sized picture book and record yourself with all the pauses you think you'd need to look at the book with a child (in Rosie's Walk, for example, you don't just read the words, you read the pictures and chat about them). Then watch it back and see if it feels right. My favourite story of mine that I've written (but it's not been picked up by a publisher) is 25 words long. This is the time I wish I could illustrate so I could make it myself! (Incidentally, with the 25 word one, I did make a dummy book -just for myself- so I could make sure it made proper sense. You could make a dummy and show it to your peers if that helps -in addition to showing them the manuscript...) Good luck. Thanks, have been wanting to show the dummy with text, just takes that much longer to get it ready for crit purposes. BTW I know you manage your crit-group and wondered if you had set guidelines and if you'd be willing to share them. All newbies in mine and we talk about honing our process every week - would love to hear your thoughts, ahem, read a future post on it! Thanks so much for sharing this! This is the kind of information I love to read, and it's so rare to find it. It was really helpful to see your close-to-final and then final text, plus reasons for the changes you made. And I loved your idea of creating the "picture book experience" in a video-taped read-aloud. I'll definitely borrow that idea. Thanks for the great post! Excellent post! Thank you for breaking it down the way you did. I can't wait to use my ms as an exercise in slashing! I am going to share this with my critique group so we can give better feedback with an understanding of the picture book text without illustrations. I do find that my group is always asking for more when, in my mind, I see it illustrated. It can certainly be tricky when people aren't used to a picture book manuscript. Perhaps you could try typing out a favourite picture book of yours as if it were a manuscript (like Not Now Bernard, where so much of the story is told in the pictures) and sharing that with your group? Fortunately, it is a picture book editor's JOB to imagine a picture book from the picture book text. Good luck, Clare. I was so excited that I already did the slashing exercise on my own ms. It is uneasy to see it that way and the thought of sending it off to a publisher or even my critique group in this form makes me nervous. But your idea to type out my favorite PB and sharing with the group is brilliant! And I have to trust that the book editors will know how to imagine it. This does require a different mind-set. Thanks again! Hi Romelle, I wouldn't do ANYTHING with it for a while -especially not send it out. Maybe leave it for a week -if you can possibly manage to, without even reading it once, and then go back to it. And if there's someone whose opinion you really trust, perhaps you could show it to that one person (but wait a while first). Good luck with typing out a favourite picture book, Clare. Solid advice, Juliet. I do that already. I like to let my ms sit and simmer for a while...this business has taught me to be patient. Take care. So good to read this, Clare. I sometimes think of a pb text as I might do poetry, in that less is often more. I also wish that I was an artist cos then I'd draw the whole thing as it appears in my head and then pop the story in. Words can sometimes hedge a story too much or send it off on a straight-line path where pictures burst out at you. No idea if that made sense but your excellent blog did! I can think of many pbs with many more words in than I would normally write for mine but as long as they have the right number for the story, they work! Thank you SO much for this Clare! I'm trying to whittle down one of my picture book manuscripts and I know for sure this will help our mountains! Thanks, Rik. I'm really pleased. Hope the editing is fun -and tightens up your manuscript brilliantly. Completely awesome and useful post! I really appreciate you sharing your Annika edits. They really brought clarity and practicality to your suggestions for cutting words. Also, I had no idea that Nosy Crow published books as well as apps. I have a couple of their picture books apps, but hadn't gotten far enough in my research to realize they do books as well. Oh...just Googled them as I was writing this and see that in the US they are under the umbrella of Candlewick. The things I learn from this blog...awesome! Thanks, Penny. Another book that I think is well worth typing out is Oliver Jeffers' 'Lost and Found'. Fingers crossed that your latest edits will result in your recent manuscripts being picked up. Thank you, Alan. I hope you enjoy them. Excellent post and extremely helpful! Many thanks! Thank you, Linda. I'm glad it was useful.